The Lucinda is a fashionable riding breeches with anti-slip seat and Stretch leg closure. The anti-slip seat is extra stiff and flexible and provides extra grip and therefore a more stable seat while riding. The material is also breathable and skin friendly. The Stretch leg closure fits perfectly to the ankle, ensuring the best possible comfort in riding boots. The riding breeches have a zip pocket and a contrasting Pikeur logo on the left side. Made of Prestige-Micro fabric, this material is made of 65% cotton, 28% polyamide and 7% elastane and therefore comfortable in all seasons. 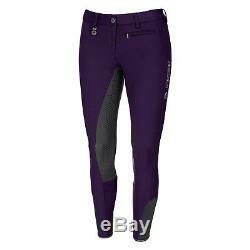 The item "Pikeur Lucinda Grip Full Seat Breeches in Grape/Shadow" is in sale since Monday, September 24, 2018. This item is in the category "Sporting Goods\Outdoor Sports\Equestrian\Clothing & Accessories\Other Rider Clothing". The seller is "dressageboutique" and is located in Hernando, Mississippi. This item can be shipped worldwide.